Attention rural health grant writers and managers! NOSORH is now offering an on-demand Grant Writing Institute designed for individuals looking for education beyond the introductory or beginning level. This course is the only grant education of its kind focused on the needs of rural health grant writers. Topics will include learning communication strategies to connect with funders, using work plans to meet basic grant reporting, understanding how to create meaningful evaluation tools, and how to use data. Past participation in NOSORH’s Grant Writing Institute is not required. For more information, contact Tammy Norville at tammyn@nosorh.org. 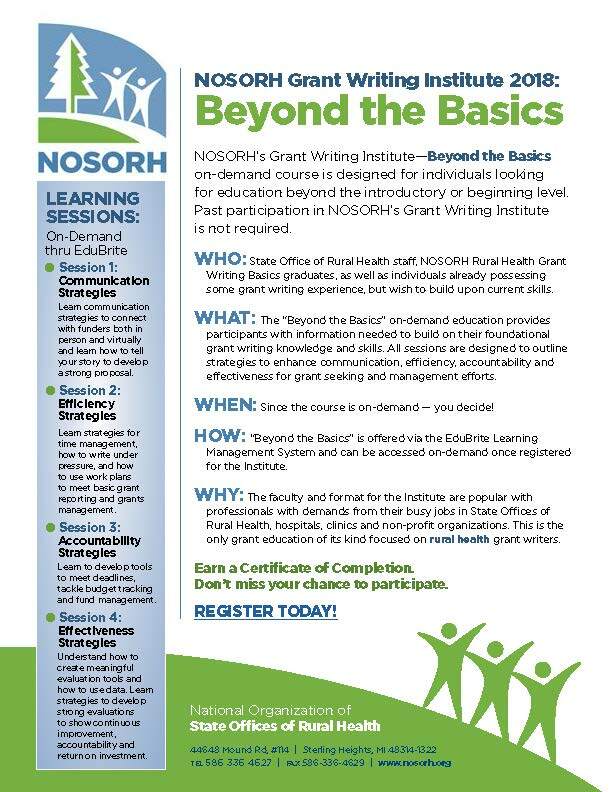 NOSORH’s Grant Writing Institute—Beyond the Basics is now on-demand! This course is designed for individuals looking for education beyond the introductory or beginning level. This is the only grant education of its kind focused on rural health grant writers. Topics will include learning communication strategies to connect with funders, using work plans to meet basic grant reporting, understanding how to create meaningful evaluation tools, and how to use data. Past participation in NOSORH’s Grant Writing Institute is not required. 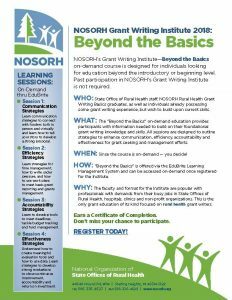 The 2018 NOSORH Grant Writing Institute (GWI) kicks off on January 11 with a series of nine, bi-monthly online learning sessions with a unique rural health focus. The GWI is intended for novice grant writers pursuing skills to research and draft winning proposals from a variety of agencies. Participants will also learn how to form a consortium, develop collaborative proposals, and replicate evidence-based models in their communities. Please share this information with anyone interested in pursuing grant writing. Click here for a flyer with detailed information on each session. Class size is limited, so register now (Deadline: January 3, 2018)! A group discount is available; for every four registered participants, one free registration will be granted. Contact Kassie Clarke for more information. Registration is now open for the 2018 NOSORH Grant Writing Institute (GWI). GWI features a series of nine online learning sessions that cover every aspect of grant writing with a unique rural health focus. The series is intended for beginners seeking to gain the skills to research and draft winning proposals from various agencies. Don’t miss this opportunity to turn rurality to your advantage, learn to connect with funders, and more! Click here to register by January 3, 2018. A group discount is available. Class size is limited, so register soon! Check out the 2018 Grant Writing Institute Flyer or contact Kassie Clarke for more information. Learning sessions begin January 11, 2018. 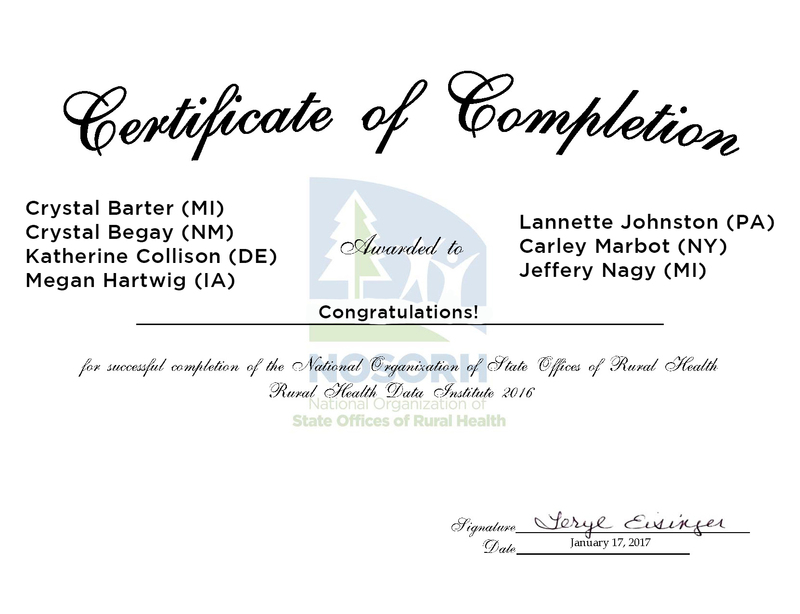 Thanks to the State Offices of Rural Health who enrolled and supported other rural stakeholders to participate in three NOSORH Institutes. In July, NOSORH provided the second Grant Writing Institute designed specifically for Emergency Medical Services personnel. The course is a 3-part series and focuses on the A-Z in grant writing, funding innovative models of care and learning how to connect and collaborate with funders, community members and stakeholders. Eighty-four EMS personnel, representing 26 states, participated with 62% receiving certificates of completion. NOSORH also offered Grant Writing Basics for SORH, rural clinics, hospitals, and others. This series takes a deep dive into grant writing and covers all aspects of the grant writing process. To see a list of graduates from both of these Institutes in your state click here. Click here to see some examples of the work completed by the graduates. 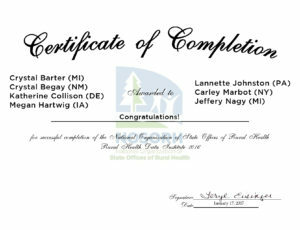 Congratulations to each of the SORH staff who earned a certificate of completion! The EMS Grant Writing 101 Institute starts next month! This 3-part webinar series introduces EMS agencies to the basics of grant writing, how to connect with funders and partners, and where to find funding. Please share this information with EMS agencies and partners in your state and encourage them to participate. The Institute begins on July 11 and will be held on three consecutive Tuesdays at 3:00 pm ET. All sessions will be recorded. To register, go to https://www.regonline.com/EMSGWI17. The deadline to register is June 30. For more information, please contact Kassie Clarke at kassiec@nosorh.org. EMS Grant Writing 101 Institute- Register Now! NOSORH is launching another EMS Grant Writing 101 Institute this July. This 3-part webinar series introduces EMS agencies to the basics of grant writing, how to connect with funders and partners, and where to find funding. NOSORH will also provide templates to help agencies get started with the writing process. The series begins on July 11 and will be held on three consecutive Tuesdays at 3:00 pm ET. All sessions will be recorded. Please share this information with EMS agencies and partners in your state. To register, go to https://www.regonline.com/EMSGWI17. Registration ends June 30. Registration is now open for the 2017 NOSORH Grant Writing Institute (GWI). GWI features a series of nine online learning sessions that cover every aspect of grant writing with a unique rural health focus. The series is intended for beginners seeking to gain the skills to research and draft winning proposals from various agencies. Don’t miss this opportunity to turn rurality to your advantage, learn to connect with funders, and more! Click here to register by March 29, 2017. A group discount is available. Class size is limited, so register soon! Check out the 2017 Grant Writing Institute Flyer or contact Kassie Clarke for more information. Learning sessions begin April 6, 2017. “Everything was spelled out and there were no assumptions of knowledge. I also appreciated some of the templates that were provided. I will use these going forward in some of my grants.